Efficiency is imperative with chemical processing applications. Time is a valuable commodity in the processing arena. Seconds wasted can cost a company thousands of dollars per day.That is precisely why we at Arlyn Scales designed our Drum Scales in a manner that accommodates drums efficiently. From start to finish, our scales are built to last through the years of rugged wear that accompanies chemical processing applications. We pride ourselves on maintaining our high standards throughout the process of manufacturing our scales. Despite the expense of the grade of stainless steel that we use throughout our scales, we wouldn’t have it any other way. In our estimation, scales should be built to withstand the rigors of industrial use and in order to do so, cutting corners cannot be part of the equation. When companies are looking to save money, the material choice for the load cells turns to aluminum. Easy to tool and widely available, it is no wonder it is so popular. For some applications, it provides a means to an end. However, for chemical processing applications, aluminum load cells are not going to hold up to the constant rugged handling of drums going on and off the scales or survive coming into contact with any chemical spills or leaks. The process for manufacturing the best drum scales built to withstand this heavy type of activity requires the highest grade of heat-treated stainless steel load cells. We continue the process by choosing four precision matched load cells that are suited for corrosive environments. In most scales that are found in today’s market, the load cells are bolted to the bottom of the scale. Scales of this nature are vulnerable to corrosion and shock and overload damage. The nature of drum weighing is such that these scales will inadvertently receive unintentional side hits. This repeated action will cause damage to the unprotected load cells and as a result the weighing data is apt to be inaccurate and inconsistent.Our methodology provides the ultimate protection for our top performing load cells. We machine pocket the housing for the load cells in the four corners of the welded aluminum frame. Out of harms way, moisture and corrosive ingredients never come into contact with the load cells. We manufacture the platforms from diamond-plated aluminum to guard against slippage. For more difficult environments, the platform can be ordered in stainless steel construction. For the most corrosive situations, and to further protect the platform from scratches and ensuing rust issues, we offer an optional triple epoxy layer with mica and garnet particles embedded. 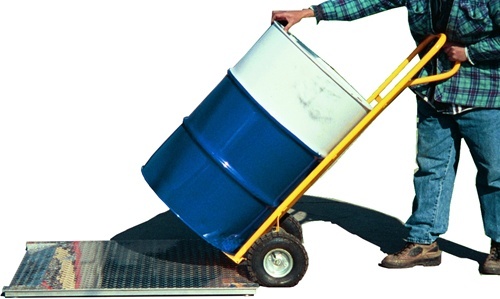 We have designed this drum scale without the typical side rails to allow larger sized weight loads onto the platform. Whatever overhang occurs, it doesn’t impede the accurate weight reading. This is due to the proper selection and placement of the load cells. The low profile of one and seven eighths of an inch high makes for easy on and off access and to further this end we supply ramps of different sizes to match the platform of your scale. The correct choice of a drum scale will contribute to the efficacy of the scale. Familiarization with the weight of the drums should inform the proper selection. For instance, if the drums to be weighed were three hundred and fifty pounds, it would be best to go with our five hundred pound capacity scale. The accuracy will be greater as it produces a resolution of one tenth of a pound. The one thousand pound capacity scales have a resolution of two tenths of a pound. Along with the ramps, we provide a state of the art Digital Indicator. This 32-bit display is capable of USB and Ethernet connections. The easy to program, twelve-button keypad has automatic buttons for tare, memory, net/gross and zero functions. Textual and numeric information can be keyed in and displayed along with seven built in unit conversions. The indicator is water resistant and is available with a stainless steel display enclosure, which is what we recommend for chemical processing applications. With the one inch sized readouts, the indicator can be placed on a nearby wall or bench for easy viewing.We include our Remote Indicator Software, which allows the scale’s operator to operate the scale from their workstation computer or other remote location. For field operations, we offer a six-cell NiMH rechargeable battery pack, which provides up to twenty hours of operation on a four-hour peak charge. For capturing data in the field, we provide our Data logging option. One need only purchase the USB connector and plug the thumb drive into the port on the indicator. Weight, time, date, group and other pertinent data information is captured on the drive in a CSV format. The data files can then be read with most Microsoft software, particularly Excel. This four-gigabyte flash drive contains enough space for millions of readings.For further connectivity to computers or workstations, we provide the RS-232 protocol. With a USB connection and this protocol, you have data acquisition and control of the scale in a bi directional interface.For a more robust network, where tethering up to ten scales is necessary, our RS-485 multi-drop protocol is needed. In conjunction with USB connectivity, the operational capacity of this network covers distances of up to four thousand feet, allowing up to ten scales to be controlled by one computer.Arlyn Scales is a full service manufacturer of high quality, precise and accurate industrial scales for a myriad of applications. Manufacturing our own scales and subassemblies gives us a measure of control that ensures quality. Providing factory-direct sales without the need for wholesalers enables us to pass the cost savings directly on to our customers. Our customer satisfaction policy is one of the best offered as we are available to customize any and every aspect of the drum scale culminating in the perfect weighing solution for your chemical processing application. For more information or to begin your drum scale purchase, contact us through our convenient online form at www.ArlynScales.com or by phone at (800) 645-4301.